[Corbin] hates fumbling around in the dark with his alarm blaring, looking for the off switch. He was so annoyed with regular alarm clocks that he decided to build his own simpler timepiece. 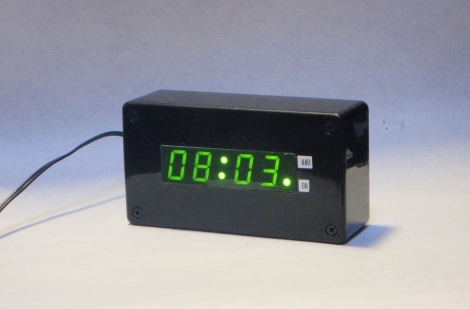 The FlipClock resides in a simple black plastic case lacking any buttons whatsoever. When the alarm goes off, all one needs to do is flip the clock over to disable it. The digits automatically right themselves using an accelerometer to detect when the clock has been turned upside down, and an indicator LED lets you know that the alarm has been turned off. The clock is based around a Propeller chip, which manages all of the clock’s operations. Instead of using a real time clock IC, [Corbin] is using a GPS module to keep accurate time, something we don’t recall seeing in an alarm clock before. That’s a good thing though, since there are no buttons with which to set the clock. In fact, there are no buttons to set the alarm either – the clock is configured to sound the alarm at the same time each day. While this clock would certainly be too dangerous for a chronic snooze button abuser like myself, it’s an interesting concept nonetheless! Check out the video below to see the FlipClock in action. Cool, but I was expecting some sort of Kinect-based hack allowing one to turn off one’s alarm via certain specific hand motions especially suited to addressing one’s alarm. The IR cam would even let it work in the dark! This is a very elegant design. I like it. It looks very nice. I would just give it a curved, weighted bottom that would right itself without an additional arm and motor. And a way to set the alarm would be nice. Inspiring, nonetheless. Why didn’t he just buy an alarm clock where like half the thing is the snooze button? (I think most of them are like that.) Just slap your clock, then look for the switch. why not just use a mercury switch? Seems VERY over designed. I’m going to go out on a limb and say that the author may not have wanted a glass bulb filled with mercury inside his project intended to be lobbed across the room. It’s a tiny bulb, in an enclosure. If he was that concerned with safety he’d buy off the shelf alarm clock. GPS? So does this work indoors? Does the clock work through the wood, or in interior rooms? A useful upgrade might be to add a female RF in connector with +3.3 v for an active GPS antenna, and another connector that made the internal 1PPS signal available for other devices to use. Flipping it over should be snooze and large jolts like throwing it against a wall could be the turn off function. You would have to suspend the circuit by springs though. Use a 1pps aware kernel – get the second time via the NMEA stream and the tick from the leading edge of the 1PPS. The kernel then uses shared memory to send it to chrony, ntpd and the ntpd refclock drivers or gpsd. Mercury switch is a bad idea..what would happen if it was taken apart by a child..
a much better idea would be a quality microswitch on the bottom, or inside with a small weight on it. Did you really ask what would happen if it was taken apart by a child?? You’re absolutely right, but don’t forget everything which runs on 120V AC (hazardous interior), microwaves, all major appliances, people, animals, the earth. Whatever, it’s all harmful if used improperly. Ban it all. Some of the coolest things I remember taking apart as a child had plenty of mercury switches. We always treated them with the proper amount of reverence. It makes me kind of sad to exist in a world where my children will not be able to disassemble stuff and find anything nearly as amazing as a mercury switch. I agree mercury switch would have been best. I played with mercury as a child once or twice and I’m no worse off for it. It’s really not such a major problem. You could always use something like sugru or clay or whatever to reinforce the mercury switch. After reading the authors website I think the above should read that the clock uses an RTC IC “in addition to GPS” and not “instead of”. And although it seems pedantic the clock isn’t really “keeping” time if it is just displaying GPS data. Looks like a fun project and I agree with the author about giving projects a finished look. I really like this project and the only thing i suggest is have the power cable come out of the back so it doesn’t become tangled over time. I could see use of the accelerometer to set the alarm via detecting tilt on the x axis to adjust alarm forward/backwards. Since GPS returns UTC, what about selection of time zone/daylight savings? I guess the former is just hard coded? No good if your a space man in zero gravity. The GPS satellites would be pointed the wrong way anyhow. I guess it is only good for the billions of people on earth, and not for the tiny handful of people in space. I once built a nixie clock that uses an accelerometer for adjusting the time and alarm via tilt and shake. No buttons either. The same could be done here to make it more functional. To answer some questions: The reason I did not use a mercury switch was because there is an additional feature that the author of the article didn’t note: The ability to set the alarm by setting the clock up on it’s side and tilting it back and forth. The GPS seems to work fine inside for picking up the time, and would work in multiple locations around the house. However, it will not pick up location data unless you go outside. I admit that the GPS is major overkill for a simple alarm clock, which is why I also included the RTC. 2 months later (I built this project a while ago) it paid off: I removed the GPS module for another project and I now use the time off of the RTC. I’ve always just wished the big button on my alarm clocks would reset the alarm for tomorrow, instead of being a snooze. Having to flick the sliding switch back and forth every day means I go through alarm clocks too quickly. All GPS’s have to have a semi-decent (<50 ppm) realtime clock or every single time you turned them on they would have to figure out where they were BEFORE giving you the correct time. So you would be looking at several minutes at best. If you look at any GPS you will see a battery or supercap to keep that clock semi-accurate unless the thing has been off for a long time. All GPS modules can be set to output NMEA sentences, typically at 4800 Bps. – The one that is the most often used for timekeeping is GPRMC. I don’t think a GPS is overkill for an alarm clock at all. A few months ago I got two surprisingly decent USB-based GPS dongles for $9/each. At that price, I got a 50 MHz SPARC MCPU in there, a cheap crystal RTC with a battery back up, and an active patch antenna. At that price I figured that I could afford to break it so I cracked one of them open and ended up converting it into an accurate time source by adding an optoisolator and a pulse stretcher, So now it does USB, serial and 1PPS. All three. I still have not figured out what kind of box to put it in but I have these translucent plastic domes lying around, They are thin enough to be a good radome..(if the plastic is too thick it supposedly throws your time off measurably) The GPS has a flashing LED that is pretty bright. I don’t know how to measure it but I suspect that the accuracy is probably around 1 microsecond. It was a major pain soldering a wire to the chip, and in order to make the green wire remain connected, I had to put a big gob of glue on it after the soldering. It would be better if I did not have the optoisolator on there. Anything like that is going to add some small delay. But I am paranoid about ESD, we’ve had a LOT of storms recently.